Earthquakes can loosen stovepipe connections, allowing toxic fumes and extreme heat to enter your house. This can cause poisonous smoke or deadly fires. * Be sure your woodstove has been installed by a certified expert. * Use the correctly specified stovepipe for your unit. * Look for cracks in the mortar joints around the brick. * Check the attic where a hot leak could easily start a fire in wood framing. expert check it with an in-the-flue video camera. Hard-to-see or hidden cracks in the masonry wall of your chimney can cause severe damage to your home long after the earthquake is forgotten. These cracks may easily leak heat, flames and toxic smoke into your home. 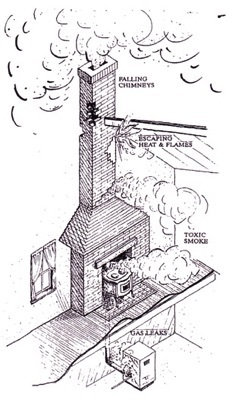 Chimneys have an airtight grout seal that keeps dangerous heat and smoke out of your home. That vital seal may have broken if the chimney shifted during the earth- quake. * lmmediately have your chimney inspected by a certified chimney inspector or masonry contractor. Find a contractor who will give you full documentation that at least a Level 2 Chimney Inspection or (if necessary) a Level 3 Chimney Inspection has been performed. * Consult your local building department for the safest, most up-to-date quake-resistant masonry construction techniques. * Take down the masonry above and including the damaged area and rebuild it to meet current masonry construction standards. * Take down the masonry above and including the damaged area and install an insulated flue above the remaining base. For more information on these techniques, contact your chimney professional and your local building department. lf damage has occurred to a masonry chimney that is no longer in use the entire chimney should be removed from the structure. * Consider reinforcing the inside of your roof or attic area around the chimney with 3/4" plywood so that if the chimney falls in a future earthquake the bricks will not come through your ceiling. * Secure the area under the chimney with a fence or flower bed to keep people out of potentially dangerous area. An undetected gas leak in your home could be fatal - especially at night. The earth- quake may have loosened connections on your gas furnace or hot water heater, causing deadly natural gas to leak into your home. * Turn off your gas service immediately. * DO NOT USE MATCHES OR OPEN FLAME TO CHECK FOR LEAKS! * Check all gas connections thoroughly for leaks, even if everything looks and smells all right. * lf you suspect a leak - even if you do not smell anything suspicious - call a certified repair person immediately. * Replace your straight pipe connection with flexible pipe if allowed by code and the appliance manufacturer's specifications. An earthquake can cause movement in your roof that is so slight that you might not notice any damage until after the first good rain. Then you may see signs of new water leaks. * Roof elements (chimneys, vents, gables) that may have shifted during the quake and cracked the flashing seals around them. * lf they are obviously out of alignment, or even if they appear properly placed, the waterproof seals around them may be broken. Earthquakes are most common in the Pacific Coast region. According to the Federal Emergency Management Agency, states such as New York, New Jersey, Tennessee and South Carolina are also at significant risk. But, no matter where you live it would be wise to take all possible precautions for an earthquake BEFORE it happens. Reprinted, with permission, from the May-June 2011 issue of The Chimney Sweep News, an independent trade magazine for chimney service professionals. Jim Gillam, editor/publisher. 541-882-5196. Hidden damage caused by an earthquake could prove fatal to you or your family. A masonry chimney, woodstove, or gas line could leak toxic fumes or excessive heat into your home. Small cracks or loosened connections may pose a threat from a previously airtight system.